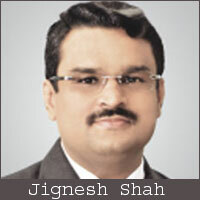 After nearly five months of probe, CBI on Monday registered a case against Jigesh Shah and SEBI officials and its former executive director J N Gupta for allegedly violating law to grant extension to MCX-SX and FTIL as private stock exchange. CBI, which filed an FIR in the case, has charged Gupta, at present Executive Director S V Muralidhar Rao, Deputy General Manager, Rajesh Dangeti and Assistant General Manager Vishakha More and companies FTIL, MCX, Shah-promoted FTIL with cheating, criminal conspiracy and abuse of official positions. More, who received the best employee award by the Union Ministry of Social Justice and Empowerment from President Pranab Mukherjee last year, had surprised many in the Securities rpt Securities Exchange Board of India (SEBI) as she was visually impaired. 42-year-old More has been using two softwares, JAWS (Job Access With Speech) and OCRS (Optical Character Recognition Software), to read files and emails while her notes and markers are in Braille. CBI officials said they would definitely probe whether she was misled by her colleagues whose help she used to take in case any note was handwritten. When contacted, Gupta refused to comment anything about the case having been registered by CBI under section 120-B (Criminal Conspiracy) 420 (Cheating) of IPC. The agency has also accused them under 13(2) and 13(1) (d) (iii) of Prevention of Corruption Act, 1988 (while holding office as a public servant, obtains for any person any valuable thing or pecuniary advantage without any public interest). The sources said that the agency also recommended departmental action against former SEBI Chairman C B Bhave and ex-member K M Abraham as there was not enough evidence against the duo to prosecute them in a court. CBI alleged Shah had entered into a buy-back arrangement with a nationalised bank in violation of Securities Contract Regulation Act, 1956 and Securities Contract (Regulation) (Manner of Increasing and Maintaining Public Shareholdings in Recognized Stock Exchanges) Regulation, 2006. The accused allegedly in connivance with SEBI officials, deliberately suppressed this material fact while applying for extension of recognition of the Stock Exchange, to conduct trade in currency derivatives, and fraudulently obtained the extension of recognition of the Exchange in 2009 by cheating SEBI. It has been further alleged that the SEBI officials deliberately did not issue notice for cancellation of its recognition in currency derivatives when SEBI had already rejected a request of the same stock exchange for trading in other segments. Shah is already under the scanner of EOW and other probe agencies like ED since last year when National Spot Exchange Ltd (NSEL), part of the Financial Technologies (India) Limited group founded by him, faced a payment crisis as nearly 18,000 of its investors allegedly lost millions of rupees. The size of the scam has been pegged at Rs 5,600 crore. MCX-SX was set up by FTIL and its commodity exchange arm MCX and began functioning as a full-fledged stock exchange last year after a prolonged battle with SEBI. The exchange was initially granted permission for only a limited segment of currency derivatives in 2008, on the condition that its licence would require approval every year. Last year, SEBI had asked MCX-SX to restructure its board and governance structure after a payment crisis broke out at NSEL. MCX-SX was initially given licence to operate in a limited segment of currency derivatives in 2008, but SEBI refused permission to allow it to act as a full-fledged bourse for years as it was not found to be in compliance with existing regulations for the same. MCX-SX could launch services as a full-fledged bourse only last year after it met all the necessary regulations and conditions imposed by SEBI.